Here’s a fun game that combines two time-tested party favorites: Bingo and a Scavenger Hunt! How do you play? You pass out a card to each player. You can play the bingo game at the beginning or the end of the party. When the scavenger hunt starts, the fun really gets going. This Halloween scavenger hunt game asks players to take pictures of costumes, bring back items related to Halloween, do things (like go trick or treating), or make things (like make a Halloween mask or carve a pumpkin). The Halloween Scavenger Hunt for Kids game includes pictures of costumes, tasks, and activities that are appropriate for a younger crowd. What a great way to extend the fun at your party without adding to the cost! 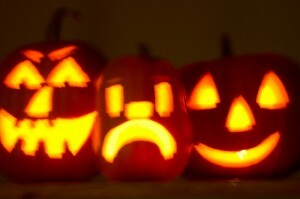 Have fun and Happy Halloween! Downloading the Scavenger Hunt Halloween Bingo Game as a printable? Be sure to take along a flashlight, or perhaps something more festive, to light the way as you fill up your scavenger hunt bag!